The Desert Equinox Program focuses on the subjects of Sun, Water, Earth and Air utilising the city of Broken Hill and the Far West region of New South Wales, Australia as the backdrop. Broken Hill has a population of approximately 18,000 people and renowned for its architecture, clarity of light, astronomy, geology and mineral rainforest, environmental landmarks, social history, heritage and culture. It is close to National Parks, the Murray Darling River and nearby Indigenous townships and it was listed as Australia’s Heritage City because of its significance to the nation in the fields of industrial relations, geology, water and land management and for the resilience of its population. 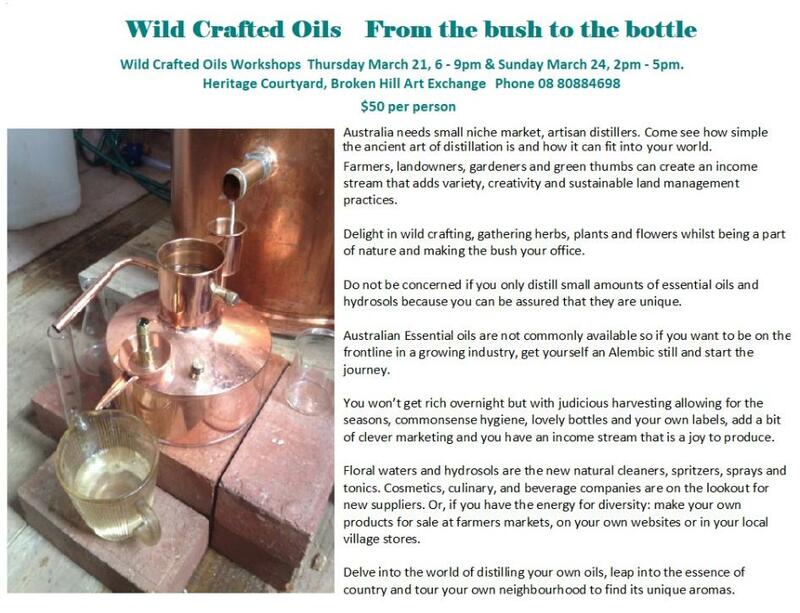 Throughout the Desert Equinox season artists and residents at the Broken Hill Art Exchange undertake self initiatedresearch, display their work, conduct workshops and projects that explore environmental and social themes. The symbiotic relationship between coral and zooxanthellae is currently challenged with our warming climate / oceans and it is the marine algal organisms that give coral its life and colour. 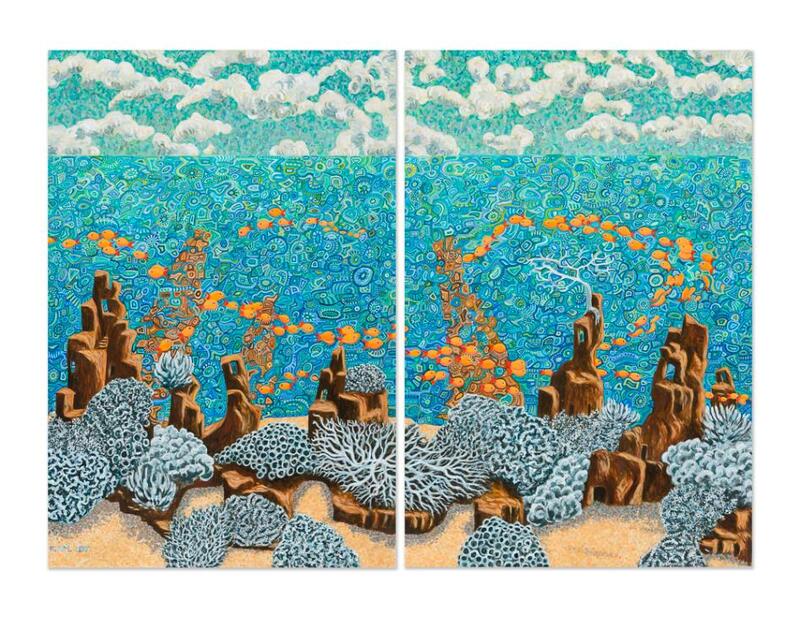 As Broken Hill is renowned as being a hot and arid place where 400 + million years ago there was once and inland sea Carl took up residence at the Broken Hill Art Exchange to paint a brightly toned diptych portraying period headstone shapes overlayed with his interpretations of zooxanthellae. 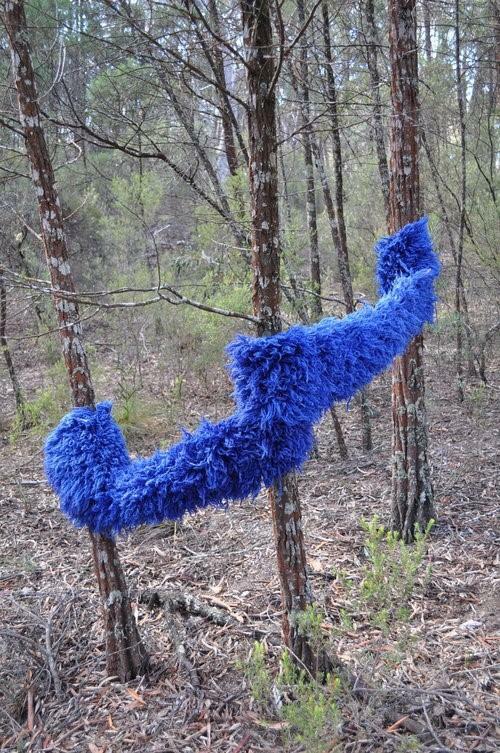 Kelly Leonard is a regional New South Wales Australian artist who hand weaves to make work in response to, and with the environment. Kelly works in a collaborative and conceptual way to make what she calls 'props' for the environment. The works are installed, photographed and removed and exhibited on line and in galleries. Kelly is inspired by the environment and the people who fight for its voice to be heard and recently commenced working with West Darling Arts as a project officer on the Barka River Project. The 'Making, Shaping and Bringing Back the Barka' project seeks to bring communities together around the stories and shared experience of the River, Culture and Country. 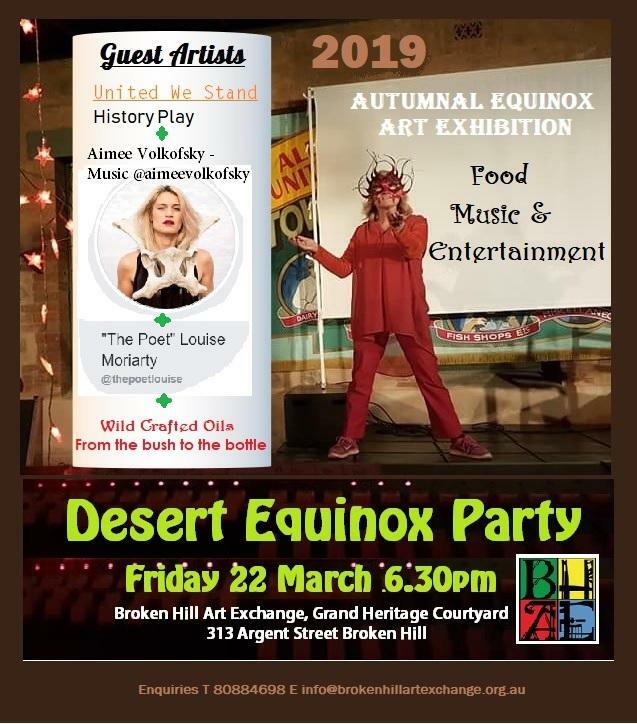 Its the official launch of the Desert Equinox season in Broken Hill & the Broken Hill Art Exchange opens its doors on Friday 22 March at 6.30pm for the Autumnal Art Exhibition and a night of live music, theatre, poetry and film. Entry is free with a food and drinks fundraiser for BHAE Inc, Join us for the autumnal equinox in the desert art event, BHAE @ The Grand 313 Argent Street. "I'll be working on a second draft of a book about 90 days of travel I did in 2017. The intention of the time away was to listen to myself and follow my intuition as a way of deciding where to go and what to do. 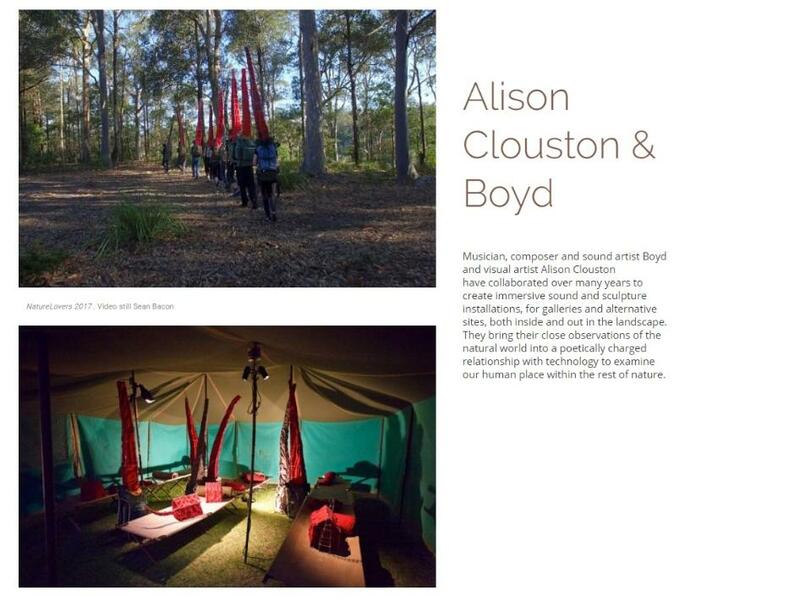 It was also born out of a yearning to spend time with nature, camping in the outback. The trip took me from Sydney to Broken Hill: The Flinders Ranges, the West MacDonald Ranges to Darwin'. Christine Long's background is in journalism writing about money, work, small business, the arts and travel. She has travelled the outback a number of times and says she loves the feeling of freedom and spaciousness it gives her. 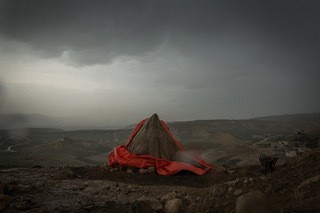 This project is an experiment, to write a lengthier work as well as writing about her personal journey, "I'm looking forward to writing about the physical, emotional and spiritual terrain I encounter... I've always found it [Broken Hill] an intriguing place - the town sheltered at the bottom of an enormous slag heap (Line of Lode); the grandeur of the buildings and street as well as the hotch - potch houses; the friendliness, warmth and down to earthiness of the people too." Christine Simpson is engaged in exploring, via visual representation, the landscape and its sonic possibilities.Through drawings, watercolours and assemblages inspired by the landscape of Broken Hill and its environs Christine hopes to find a visual vocabulary for the type of sound vibrations that she can experience in this particular landscape. Often, Christine draws landscapes as a colour field and listens for any repeating sonic patterns, which she then composes and layers into tonal arrangements.It is through a combination of materials – in Broken Hill anything from dirt, mica, plant materials and found ephemera – and methods like eco dyeing, stitching, binding and perforating paper that these tonal arrangements become visual representations of hue, light, texture and sound. Christine’s arts practice for the past 20 years is primarily making sculpture and works on and with paper. She runs and is the head arts educator of an art school in Sydney, which teaches sculpture, drawing and painting and she teaches drawing at the Art Gallery of NSW. Having been intrigued by energy fields for the past decade, be they colour, light, sound, movement or a combination of these vibrations Christine is always interested in ways to convey her findings as some sort of visual, tangible representation for that particular sense of now. The constancy of change inspires Christine and having visited Broken Hill once before she says she was struck by the quality of the light, the colours and the mica littering the ground, glimmering all over the place. The Broken Hill Heritage Festival begins on April 18, with an official launch to be held behind the Town Hall Facade at 7pm. The launch event will feature a giant projection show of historical images from the city's Outback Archives, colourful illumination of the Façade itself, and coffee, cake and slushies will be available from Fake’n Baked. Please note that vehicle access to the Town Hall Facade carpark will be unavailable from 6am Monday 15 April to 1pm Sunday 21 April. Traffic control measures will also be in place in Argent St from 15 to 20 April. During Autumn and Winter Rachel Peachey and Paul Mosig are undertaking a project with the support of the Broken Hill Regional Gallery. They will be spending extended periods of time in the landscapes around Broken Hill contemplating geological time and our own particular response to this vastness. The results of this process will be large scale video projections. In conjunction with this work the artists will be creating a further video piece using digital collage techniques. This video will deal with the human scale story of Broken Hill as told by it’s inhabitants. Peachey and Mosig are using photographs, video and sounds of the built environment and the towns historical remnants, cutting and pasting this together with interviews and stories from local people to examine a variety of perspectives in regards to landscape transformation. These techniques are the basis for workshops with local young people, exploring both realistic and absurd ways to reactivate dead spaces using elements taken from the surrounding town landscape. The result will be a site specific multimedia installation using video, sound and found objects. Rachel Peachey and Paul Mosig have been working together since meeting at the Canberra School of Art. They now live in the Blue Mountains and often collaborate with their two children, Sascha and Jack. They have a tendency to concentrate on the way people inhabit and move through landscapes, looking at how these challenges are navigated both individually and in groups. This interest is explored from a range of perspectives, sometimes historical and specific and at other times loose and emotional. Rachel also has a second degree majoring in Human Ecology, which is the trans-disciplinary study of systems theory, applying the principles of ecosystems sciences to the study of the human environment. 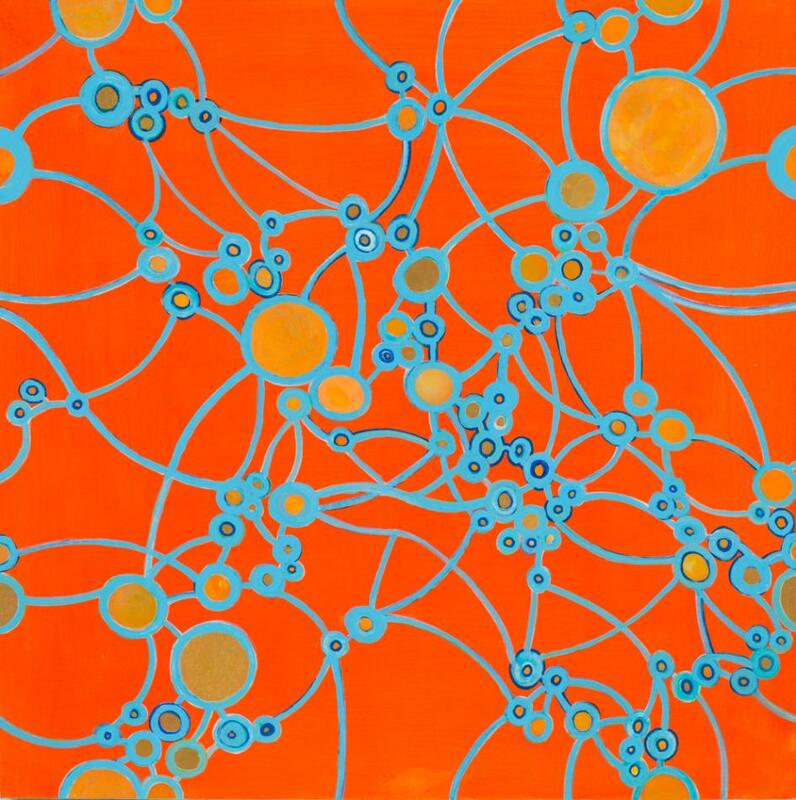 It is this theoretical approach that often informs the ideas in their artwork. The way Peachey & Mosig make work often revolves around the process of field studies - returning to specific landscapes over time and the process of play - interaction with each other and the environment with no particular outcome in mind. They use photography and video to document these processes, often adding further layers of sound, sculpture and found objects to develop the ideas that have surfaced through their activity. They have worked together like this in a variety of landscapes and contexts over the last 15 years. Their ongoing interest in human / environment relationships over the last few years developed a particular interest in geological time. They are attracted to the land around Broken Hill as a place that seems to allow consideration of timescales that are so immense they resist the imagination. They have an affinity with Romantic era scientists who held that observing nature implied understanding the self and that “knowledge of nature should not be obtained by force”. This period of inquiry was known for it’s belief in the notions of mystery and wonder, the centrality of the sense experience and the poetic relationship between science and philosophy. For Peachey & Mosig the exploration of geological time is a meeting of the rational and the intuitive. After spending time in and around Broken Hill in late 2017 the artists were affected by their experience. They felt keenly the layering of time, it’s influence on themselves and the community more generally. In returning to create an installation using video, sound and found objects to explore this layering of time in the context of landscape transformation Peachey & Mosig are interested in how humans reform the landscape to suit particular needs and then how that landscape consequently forms them. They are questioning how the transformation of landscape from mining has affected people physically, psychologically, personally and on a wider cultural level and asking what is the community view of itself now and into the future with or without mining? Contemplating whether or not we are sometimes aesthetically attracted to landscapes that are damaging to our health or longevity? Naomi Royds is developing a new body of work comprising of sculpture, photo and print for exhibition. This new work titled ‘Trove – Domestic Object as Repository of Memory' researches the personal and emotional value we place upon the humble objects in our homes. 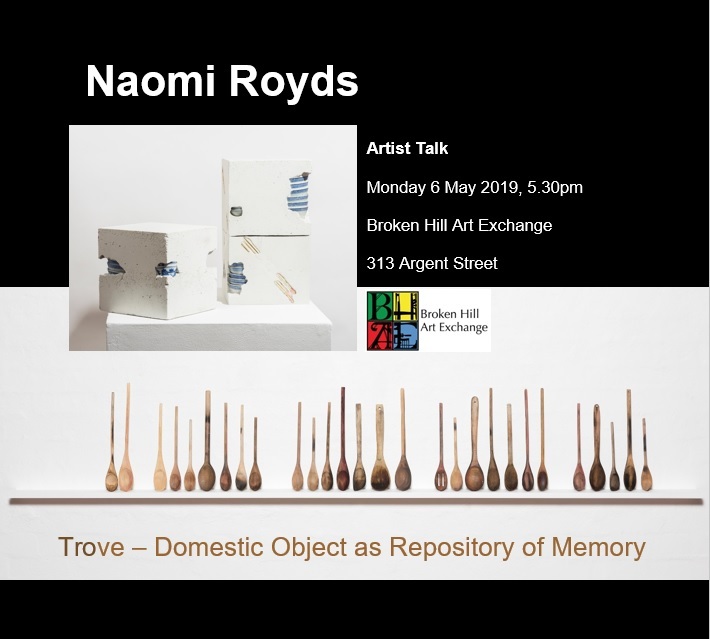 If you would like to participate in casual conversations, questionnaires and photography, taken by the artist of you holding your treasured object please phone the Broken Hill Art Exchange on 8088 4698 to meet the artist .